After a small aircraft crashes in the Kalahari Desert, one of the seven passengers decides that his survival chances would increase if he would eliminate the other men in the group. Stuart Whitman At "Sands Of The Kalahari" Screening, March 4, L.A.
Sands of the Kalahari is directed by Cy Endfield who also adapts the screenplay from the novel of the same name written by William Mulvihill. 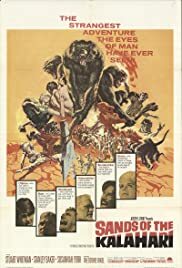 It stars Stuart Whitman, Stanley Baker, Susannah York, Harry Andrews, Theodore Bikel and Nigel Davenport. Music is by John Dankworth and cinematography by Erwin Hillier.